A Facebook fan of mine asked me about making rice four or flour-free playdough for those who are gluten sensitive. As I am lucky enough to have a family without food allergies, I turned to my network of preschool bloggers. Dawn from chasing the seasons shared a wonderful recipe with me using only baking soda, cornstarch, and water. 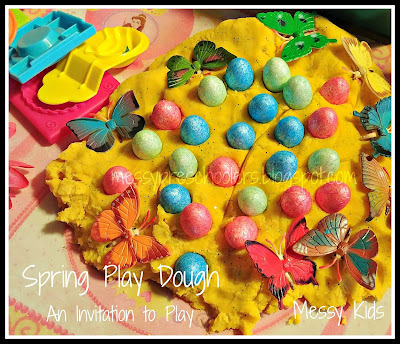 This dough is silky, smooth, and easy to mold; a nice addition to sensory play. Cornstarch, baking soda and water make up the basic ingredients of this lovely dough. You can also add color (we used a bit of tempera paint) and scents (essential oils or cooking essences). First we added the color and orange oil to the water. We placed the baking soda into the pot. Then we added the cornstarch. Michael likes to touch everything so I encouraged him to feel the cornstarch. I showed Michael how it can make his skin soft (makes a great body powder). My son, who has no problem being dirty all day long, was distraught by the cornstarch on his arm. After the dry ingredients were added, Michael poured in the colored water. We moved the pot to the stove where we began cooking the dough. Michael quickly became bored and left me to stir. The completed dough, still warm to the touch. Michael enjoyed sticking his fingers in the warm dough. Soon after he asked to play outside with Playdough...the store bought kind! I'd hoped to capture him playing with the dough on another day, but alas, my daughter played with the dough and left the bag open, causing the dough to become dry. And of course, she played with it at a moment I was unable to shoot pictures of her enjoying it. I suppose I'll just have to make it again another day! Add color (and scent) to water. Combine baking soda and cornstarch in a pot, then add water to the powdered mixture. Cook on medium heat until the dough forms a ball. Cool and knead. **A gross side note- While stirring the dough on the stove my son and I discovered bits of bug floating around in the goo. Seems a pincher bug (or bugs) crawled into the paint somehow. Mind you, I've had this particular bottle of paint for over 8 years! It's never dried out but had apparently captured insects! What was left was quickly discarded and I had to spend several minuets fishing bug parts out of our dough. The moral of the story is beware of your paint storage area...oh and in case you don't know, cockroaches will eat dried tempera paint so beware of what you store that you have painted (classroom decorations and such)! Blah! It looks almost silky. What was the texture like? I am really excited to try this one! Thanks for sharing the recipe! I also pinned it...lol. It is silky and smooth! With the color and scent I did I really wanted to eat it; made me think of orange sherbet. And thanks for pinning it! Side note. I love your counter tops. I am envious. : ) Your son looks like he is having a blast! This sounds wonderful! We need to definitely try this! Thanks for the recpe! Come and visit soon... lots of art ideas. Oh my gosh - I have the bi-lingual edition of your book Mudworks and I go to it every single week for my lesson plan play dough recipes! I'm so so happy with your book and the ability to share some of the recipes with my families without the hassle of translation, thank you for making it. It's the best sensory dough book I have come across in my 10 years with Head Start and by far the most parent friendly; it's great to be able to tell you this (somewhat) personally: Thank you!! I have your book, as well and I love it! I've been teaching 20+ years and give copies of it to co-workers as birthday presents! 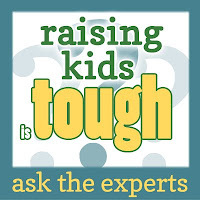 Tammy, I kept my playdough in a gallon sized ziploc bag and it kept for several days...until my daughter left the bag open. Mine was actually on the gooier side (just slightly) rather then dried out when we played with it the 2nd time. The food coloring shouldn't have made a difference...I'm thinking maybe it has to do with your location????? Do you live somewhere that's dry vs. humid? Just a guess, although it's pretty dry here in San Diego. I don't know. I guess, try again, maybe add a bit of water? Maybe if it dries out add a bit more water at that point, and let me know. Thanks for letting me know! In my experience, there is just too much air inside Rubbermaid/Tupperware containers. I've had all types of dough get dry in them. I find that a zip-top bag (not a slide top) works the best as you can squeeze all the air out of it before sealing it. Do you have an estimated amount of time that it cooks? Nikka, I'm sorry, but I do not. Maybe 10 min? You have to stay with it so it doesn't burn. When making play dough, if you ever find it too sticky, always add just a bit of the main ingredient, in this case cornstarch. It will help absorb some of the stickiness. Just like in baking bread, you only want to add a bit at a time, so not to ruin it. I suggest sprinkling, then kneading, sprinkling, then kneading, until you get to a consistency you are happy with. If you should try it again, let me know if this works for you. I am so pleased to have come across this recipe! 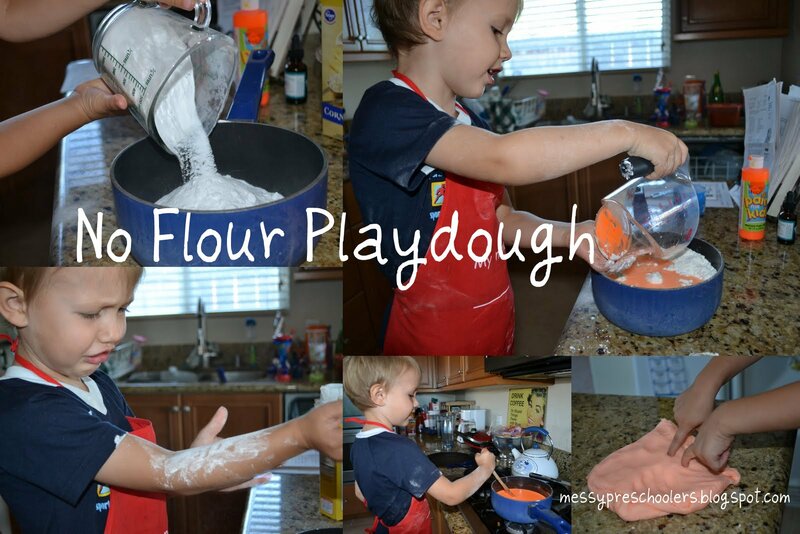 I've been looking for gluten-free play dough recipes for my preschool classroom. I've used the rice flour recipe and it comes out incredibly sticky. I just whipped up a batch of this one and so far, so good! It was very easy to cook! I threw in the ingredients, cooked it, and scraped it onto the counter top in ten minutes flat! Fingers are crossed! Thanks for sharing Melanie! Glad I could be of help. We made this and it turned out great! Sitting in a sealed jar, it did get sticky, but a couple hours with the lid off solved that. To color it, I used a package of unsweetened kool-aid. The color came out great and it has a faint berry scent. Thanks so much for the recipe! We made this today for my kids! It took a while to cook on the stove, but once it began thickening up like a pudding. When I put it into a stoneware bowl to cool, it looked like thick mashed potatoes! I scented it with peppermint oil but no color--just pure white. Since it seemed sticky, I drizzled a few drops of extra virgin olive oil on it and that made it perfect. My son saved some in a bowl in the fridge and it started to dry out. I added a few drops of water--it got very sticky but a few kneads and it all came together nicely. A few more drops of oil and it was perfect to play with again. We are storing it in a ziploc bag in the fridge. We also rolled it out and cut it into shapes and baked them at 350 for just about 5 minutes....perfect Christmas ornaments (poke a hole with a toothpick first). We painted with paints we made from coffee, tumeric, berries, and wasabi powder. Paint lightly with a cotton swab or brush and put in 350 oven for a few minutes to "set". I did one "handprint" of a girl I babysit to give her parents and it turned out really cute. The coffee paint made the white dough a nice tan/brown color. I'll use this recipe from now on--thanks! Danielle and Missy, thanks for sharing. I'm so happy this recipe worked out for you. I'll have to try coloring with Kool Aid. That stuff works great for so many things! Can't wait to try this! It looks so soft!! (there is a typo in your post title). Thanks for sharing this recipe. @Jacki, thanks so much. I can't believe your the first person to catch that! Thanks Kristin for letting me know! Isn't Koolaid wonderful? It's so versatile! Not so healthy for drinking but great for painting and dying :) Glad your kids enjoyed it. Playing dough is really fun. During my childhood days I used to play dough and invite my friends to help me on making it. It was my grandma who taught me how to do the recipe. Well, its an old stuff that kids in all generations will enjoy to play. Just made this and the consistency is perfect. We used tempera paint and the paint seems to bleed on to everything it touches. Does that stop after it sits for awhile? Maybe I used too much paint. Next time, I think I will try the kool-aid idea. It's possible you used too much. Try letting it sit and see what happens. Kool-aid is great because the colors are so vibrant. Let me know if you go that route next time and how it turns out. Good luck. I hope the color stops bleeding. Oh that's fantastic! I love it! We're gluten free, so this is just peachy. Gluten free playdough isn't quite as fun as the gluten kind, for some reason (the consistency is more grainy, I think). We're making this on the next rainy day! I'm glad you found this recipe! You might have to play with it a bit but it is really a great recipe if you can't use flour. Me, my husband and our 2 year old son made this playdoh today. It is amazing and so easy. We had a blast with it. We used grape kool aid for the color and smell. Worked great. We will make this again. So happy you are happy. I can smell that grape Kool aid as you are talking about it; ahhh, childhood memories. I just made this for my almost 2 year old and she seemed to enjoy it (for as long as 2 year olds enjoy anything lol). It was easy to make and I was very pleased with my myself when it finally came together. I am a disappointed that it dries out rather quickly and then leaves a chalky residue. But it has a lovely texture otherwise. I used Wilton gel food color (and had to use quite a bit to get the shade I liked). I'm happy with this version overall. And I doubly happy to learn that my daughter isn't ready for Play Doh just yet! He's so funny about messy stuff. He can walk around with dirt caked on his body but any fun sensory stuff, forget it! He's getting a little better. He discovered slime at school and managed to get it everywhere! He didn't want to touch it at first but once he did he went nuts. I'm hoping he'll try cornstarch and water next because I have yet to get him to touch that. Just letting you know this play dough is AMAZING. I mentioned you in my blog, so you may have a few others popping on over too. Have a great night! Thank you for sharing and so happy you and your kids enjoyed it so much! Looks like fun! I'd love for you to join my Do Your Thing link party! i walked away for a bit as mine was 'cooking' came back and it was boiling and kinda crunchy like. I figured i ruined it, but still tried to recover it into dough. glad i stuck with it... let it cool a bit, slowly added water while was kneeding it. once it was smooth again i slowly started adding cornstarch. turned out wonderful!! thanks for the quick easy recipe! How well does this dry out? Could it be used to make a mold? I'm not sure if you could use it as a mold. I've never tried. If you do, let me know how it turns out! I'm always interested in new uses for old recipes. beautiful idea for the little ones. Ans I absolutely love the face of your son with that cornstarch on his arm! I just made some with a little girl I was watching and she loved it! I am going to put a link to this on my blog if you don't mind!?! I don't mind as long as you credit me :) Share away! If you want, send me the link when you are done and I'll share it on my FB page. The first batch I made I cooked a few seconds too long and it was a little crumbly, but I couldn't see just throwing it out. I figured with all that baking soda in there it must be good for cleaning. So I went to work on my bathroom fixtures and the plastic wall lining of our shower. I can't say it did a better than cleaning products, but it certainly held it's own and it was fun! It also was gentle on my hands not like other cleaning products. I found that adding a little bit of water was all it needed to make it smooth and not crumbly again. LOL! Well that's some repurposing you did there! And yes, usually, the rule of thumb is, if it's dry, add a little more liquid, if it's wet, add a little more of the dry ingredient, most likely the cornstarch in this case. We made this tonight but instead of paint and scents, we used a package of strawberry KoolAid. It smelled great and the color was perfect! I'm going to try it again soon with the Kool-Aid. I can already smell it in my head! I once discovered that my flour had weavils in it. I quickly made vinegar playdough with it. The kids loved playing with bug playdough. It was a huge hit and lots of fun! I once discovered that my flour had weavils in it. Instead of throwing it out I quickly made vinegar playdough. The kids loved it! Nothing like playing with bugs! Just made this....kids love it! Apparently I am the best mom ever!! does it dry hard or does it crumble ?? My first attempt at homemade. A bit to crumbly and sticky. This was so easy to make. Started out very watery but after six minutes it stated clumping and after eight mins it was ready. Was a bit sticky but that dissipated as it cooled off. I will be making a big batch of this to put into my daughter's birthday goody bags. I just made this, how easy!!! Took six mins to go from liquid to starting to clump. After eight mins ready to take out. Was a bit sticky but that went away as the dough cooled off. Going to make a big batch for my daughter's birthday goody bags. It worked great with arrowroot flour in place of the corn starch for my corn allergic son. I'm going to try adding the olive oil tomorrow if it's drying or sticky. I remember that giving another recipe a nice consistency. We used it for our Electro Dough kit and it was a great conductor. Thank you!!!! !